1. Preheat oven to 120'c or 100'c. Grease a round pizza tray . On a sheet of baking paper the size of the tray, draw a 23cm circle. then a 13cm circle inside it. Place the paper on the tray, pencil side down. 2 Using an electrical mixer, beat egg whites until soft peaks form. Add the sugar, a spoonful at a time, beating until dissolved between each addition until the mixture is thick and glossy. add corn flour and vanilla essence and beat briefly, until just combined. 3. 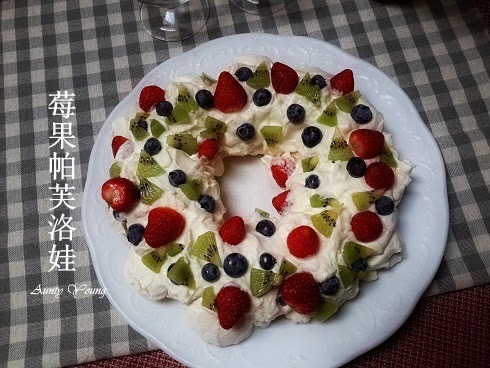 Using the pencil line as a guide, scoop large spoonfuls of meringue onto the tray to form a wreath shape. Bake for 1 hour, then turn off the oven, prop the door open slightly and leave to cool completely. 4. 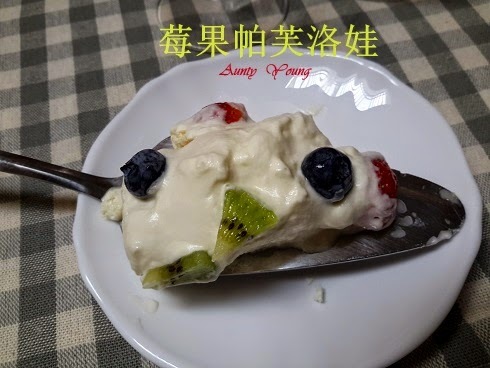 To serve, carefully run a large knife between the pavlova and the paper to loosen it, then slide onto a serving plate. 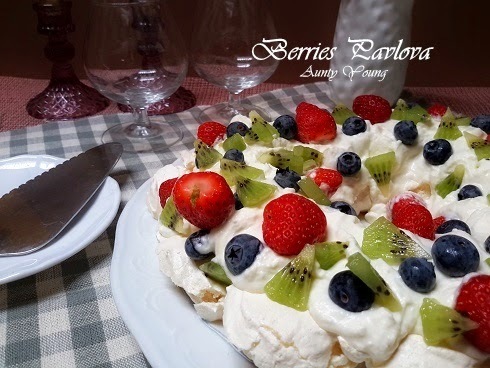 Whip the whipping cream to soft peaks and spoon over the top of the pavlova. 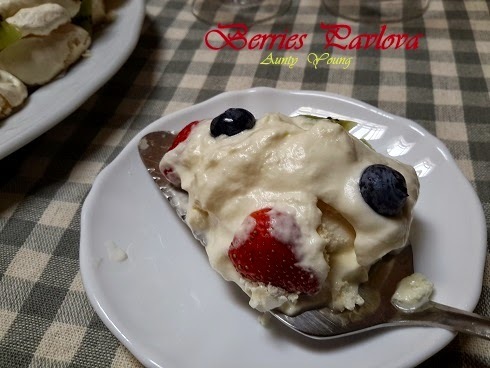 Top with th berries. 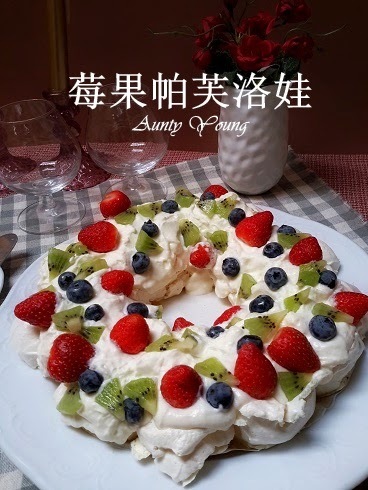 Aunty Young, I am very suaku. 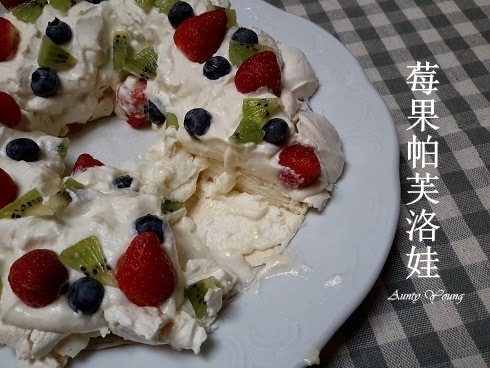 Never eaten pavlova before! It sure looks good with all those yummy berries. 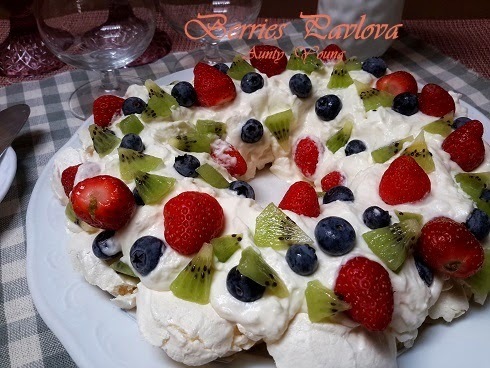 Seeing your colourful Berries Pavlova reminds me of Baked Alaska. ... eating these desserts are like in heaven .... but I dare not bake them. Can I come over to have a small bowl ?! Hee .. hee..